While wearing a helmet like the one shown here that reads EEG waves and communicates to a computer, humans could control robotic technology with their minds. Practical uses might include flying a drone and controlling a wheelchair. Ufuk Topcu, an assistant professor of aerospace engineering and engineering mechanics, is one of eight UT Austin professors selected by the National Science Foundation (NSF) to receive a 2017 Faculty Early Career Development (CAREER) Award. The award is the most prestigious offered by the NSF’s CAREER Program. The award provides up to five years of funding to junior faculty who exemplify the role of teacher-scholars through outstanding research, excellent education and the integration of education and research within the context of their organizations’ missions. Topcu’s team is working on technology that allows humans to control robots autonomously using, for example, brainwaves. 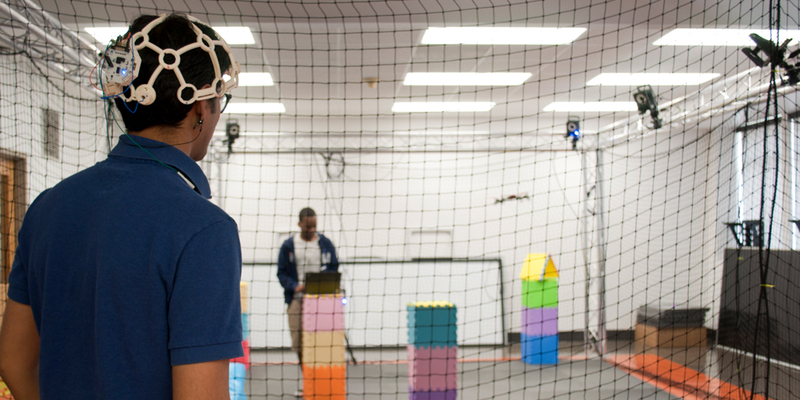 While wearing a helmet that reads EEG waves and communicates to a computer, humans could control robotic technology with their minds. Practical uses might include flying a drone and controlling a wheelchair. Because humans interact with autonomous systems through imperfect interfaces, there is uncertainty in a given situation. Topcu’s research goal for this project is to mathematically prove that these autonomous systems that interact with human operators satisfy safety and performance specifications and can be designed and deployed with minimal hardware testing. Topcu joined the ASE/EM Department in 2015. Learn more about his research here.